We knows the value of making it a habit to sit together around the table. For the family and for entertaining, inviting dining room spaces are places where people can connect and enjoy the best things in life. Red, orange and yellow are popular colors for the dining room. Yellow and orange are cheerful colors helping create a happy atmosphere and foster pleasant conversation. Red is a stimulating color for positive thoughts and lively discussions. Red in its many shades is also a symbol for love and healthy appetites. You may also choose a more neutral color and add color with wall hangings and other décor. How color is used in the room is important. Some people paint one wall in a contrasting hue or a darker or lighter shade of the same color. The way color is expressed and arranged is a major design element, and the room should be comfortable and appealing to those who spend the most time in the space. For the large dining space, a dining set with long rectangular or oval table fits easily. A good rule for the table size is to allow for three feet behind each chair around the table. People should not feel cramped when pulling out their chairs to sit in them or when walking around the table. The furniture in the room should not only look great, it should be comfortable. Selecting different features or styles for the chairs at the head and foot of the table or using two of one style and two of another for smaller tables makes the room feel less rigid. Also for normal wear-and-tear, leather-cushioned chairs are comfortable for sitting and are easy to keep clean. The room looks bare without the little touches like a centerpiece for the table and wall art. Accent items should not be huge or overpowering. Attractive accessories should help add color, texture and warmth. You will also want to choose the right lighting for the room. Maybe you will want a large chandelier or other interior deluxe lighting. Regardless of what you choose, the lighting in the dining room is an important accessory. Fresh flowers are perfect for keeping the room fresh. However, even the wall art can be changed from time to time. Celebrating the seasons is enjoyable and changes the accents four times a year. Maintaining a clean and tidy room as well as rotating the centerpieces and other decorations makes an inviting space. Redoing a dining room can be a big project. However, some of these suggestions are so simple they could be done incredibly easily and inexpensively! 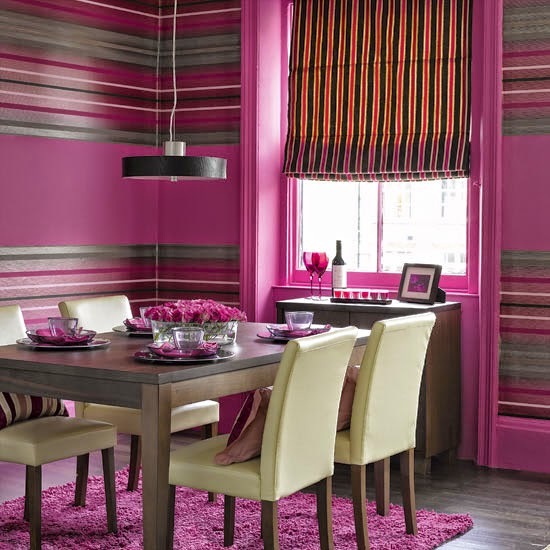 For example, just changing up the accessories in your dining room can give it a completely different feel.